It would be cliche and understated to say Fabian Nicieza's run was lighting in a bottle. It was a radioactive A-bomb in a human rocket. While Firestar and Nova were two of the most high-profile members of Marvel's The New Warriors, the book's original success didn't hang on their respective shoulders alone. 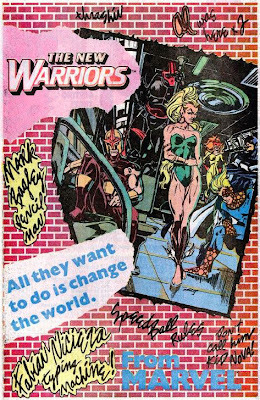 The only title I can remember running home to read, as The New Warriors prepare for a new series in February 2014, I wanted to highlight four reasons why these well intentioned heroes of hard-knocks are more than marvellous teen titans. If making mistakes and learning from them is the price of wisdom, The Warriors should be wiser than Reed and Sue Richards combined - even if their lives, loves and faces got steamrolled in the process. Rage helped the cash-strapped heroes steal an Avengers Quinjet to defeat the murderous Tai, and was expelled from 'Earth's Mightiest' as a result. Marvel Boy was convicted of killing his abusive, repressed homosexual father and was put into superhuman prison, The Vault. Then in the mother of all f#$k-ups, an overstressed Namorita relieved her tensions in a one night stand with a man who was looking to settle a debt of honour against Night Thrasher. Stealing her address book (this was the pre-Facebook days after all), his gang then used it to capture, mutilate and kill her teammates most beloved. Sure that stuff is probably in Garfield these days, but back then this was major. 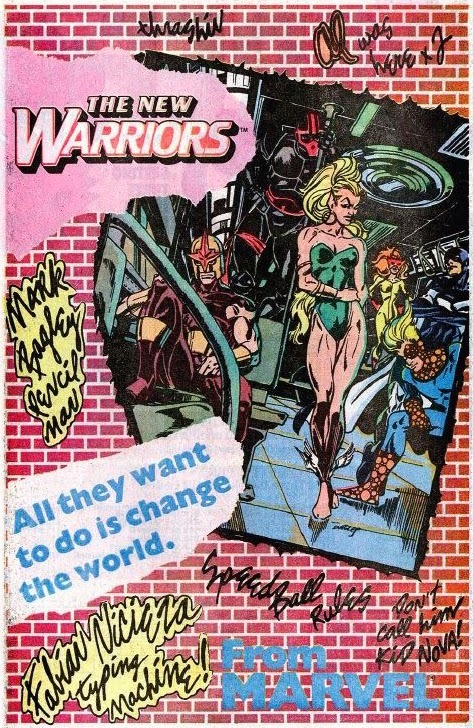 Still, in true Marvel style, the Warriors fought back to stand again, and no matter what you as a reader were facing in your life, feeling like one of them, you knew you could too. You see it in every team title relaunch. There's an A-lister, a handful of fan favourites and the token new creations for the writer to make their mark with, who the next writer will probably kill off. Heck - did we ever see that bubble headed guy in the promo art for New Avengers #1? 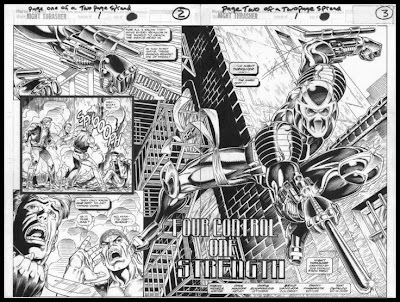 Night Thrasher was the first (and still one of the only instances) where that longstanding comic tradition was flipped on it's head. Despite the prior histories of Namorita and Speedball, New Warriors was his book. Two of the biggest stories from Fabian's run, Nothing But The Truth and Poisoned Memories sprang from Dwayne's past and history. Stamping his authority and direction across the formerly solo-act heroes he'd recruited, Night Thrasher always hit first, and his struggle for control of the Taylor Foundation led him and fellow newbie Silhouette to helm the books first mini-series and ongoing series, Night Thrasher: Four Control and Night Thrasher respectively. Not Nova, Thrash. Sure, issue 27 was an Infinity War tie-in, but other than that New Warriors was left to do it's own thing; consistently wow fans with fairly self-contained stories. Sure Punisher and a few guest-stars dropped in, but like with the Infinity War, Punisher was used in addition to the plot of those three issues, not as a dominating factor. The same consistency was applied to the creative team. Despite Fabian's success launching X-Force with Rob Liefeld and being the writer to script X-Men post-Chris Claremont, Marvel left him to run on New Warriors for 51 issues (plus annuals, and various issues of both the Nova series of the time and the Thrash projects mentioned above). By Nicieza's side, and having his back, both core series artist's put plot before image. 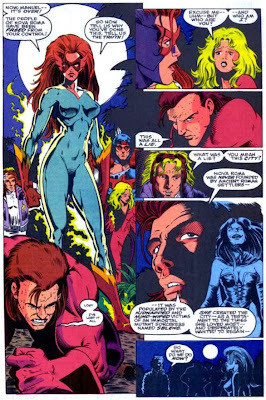 Mark took misfit heroes whose looks were more famous than the heroes themselves (Firestar, Nova, Speedball), unified and made them his own. Darrick continued this magic with his own brand of dynamic page layouts and Kirby-esque punch scenes. Better yet, the team itself was just as consistent. For four years plus the musical chair rosters of other books were shamed by a core line-up of Silhouette, Nova, Firestar, Night Thrasher, Rage, Speedball, Marvel Boy/Justice, and Namorita. Even the 'reservists' were pretty much in lockdown, stretching to Hindsight Lad, Darkhawk and Turbo (both Mickey and her brother Mike who shared the suit with her). When Warriors wanted an X-Man that wrestled with the dark, they chose Archangel not Storm (and even he played second to Cloak and Dagger). As with the art mentioned above, Fabian's character work dictated this series from head to toe, guest-stars to villains. From Angelica's 'Hellion' past to Nova's Xanadarian heritage or Speedball's Dad, the majority of opponents the surrogate family of heroes faced were from their own respective pasts. Not only did this allow the core cast to be more intimate with the readers and better rounded as characters, their opponents were generally at their level. Not maniacal world would-be conquerors. The Sphinxes wanted power over each other, Tai wanted her prophecy, Forces of Nature, Bengal Tiger and Cardinal did what they were paid, Darkling wanted the light to experience the darkness he'd endured, Super Nova wanted to rebirth his people and Poison Memories wanted honour. When you have plots as juicy as that, who needs Doctor Doom? What do you think? What are your New Warriors memories, and traits you hope the new series will continue? I only ever really bought occasional issues of it - like when the FF's major villain Terrax appeared, tho there was one early Avengers Annual where the New Warriors appeared with the FF alongside the Avengers [Herb Trimpe art, too, sweet]. I cant say I thought much of the comic - maybe teen heroes were getting a bit much for me at the time; and I was too hooked on the LSH and Teen Titans so maybe another was too much to take. Only three Warriors appealed to me - Firestar, from the Spidey cartoon from the late 70s, [don't laugh!] as I was pleased she was the same character from the cartoon - apparently she was created for the book on the back of the cartoon itself, a rarity for such a character. Namorita I knew [faintly] from the Sub-Mariner. But the one who appealed to me most was Nova. Back in the late 70s, he became a minor, brief sensation here in England due to his reprints in our British Marvel weeklies. He was touted as a cross between Spidey and Captain Marvel, because his teen angst was thought so similar to Spidey's. I recall vividly when he guest-appeared in the FF reprints during the ten-part Skrull/Sphinx saga, when they encounterd him in space along with other heroes such as Diamondback. From that initial outlay, Marvel UK ran his ongoing comic, but it was abruptly cut short after several months [an ongoing problem with our weeklies was that they caught up fast with the American counterparts so were often dropped and replaced with other strips.]. Nova had quite the fanbase but it quickly died out. The FF appeared so much in the early days Karl, they almost out guest-starred Spidey or the X-Men! Mind you Thing had a prior history with Justice, and Nova and like you say Terrax came back a few times. For some reason, one of their best scenes for me is in the annual pictured above where Silhouette seeks Reeds help. It's not a major moment, but a good character one all the same. Thing and Human Torch were also great in Forces of Darkness Forces of Light too. For me the incentive to pick up New Warriors was Darkhawk. I jumped aboard just after the first issue and from that point on become hooked, picking up all previous as the future issues come in. LSH, GenX, New Teen Titans, Gen13, Runaways, I always dig a well done teen team! It's odd, in our Marvel UK weeklies, we had Hercules, Iceman, Droids and Rocket Raccoon back-ups that I remember. I would've dug Nova too! Hercules was far and away my favourite, getting Galactus drunk and all - talk about the ultimate nullifier! Thanks Dan. Have you got any issue numbers for those the FF guest appeared in, by any chance? Thanks for that, Dan. Appreciated. On our FF forum they were discussing heroes that are thought outsiders by the rest of their teammates, and Silhouette's name came up in relation to the New Warriors. No worries Karl - yeah Sil was even mentioned as "liking to keep to herself" - which I guess is always true of groups of friends huh?